We answer some of the common questions about concussions. Download your copy of our FREE educational handbook! ✓ So, You Had a Concussion. Now What? 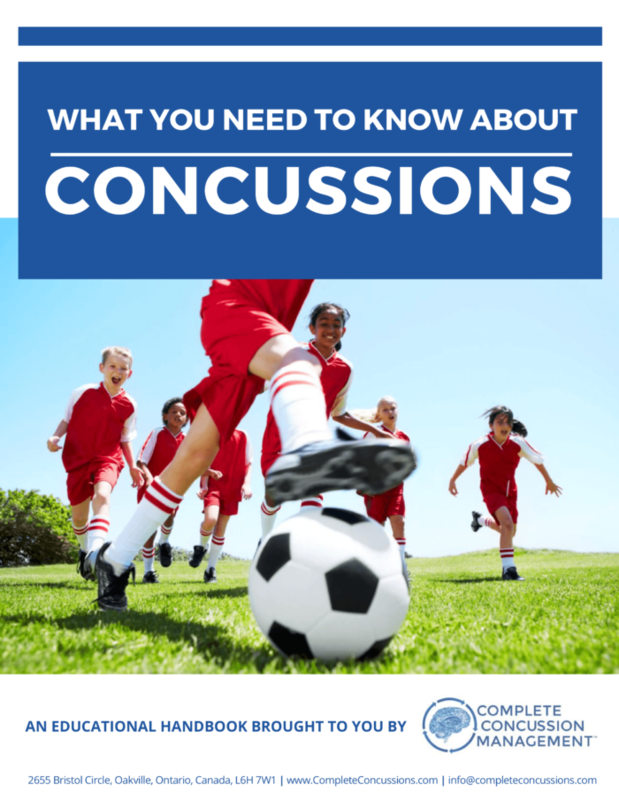 A concussion is a mild form of brain injury that causes a temporary disturbance in cells caused by acceleration or deceleration of the brain within the skull. A concussion is caused by acceleration or deceleration of the brain, following a significant impact to the head or elsewhere on the body. One common misconception is that someone must be hit in the head to cause a concussion; however, a significant enough hit to the body may cause a whiplash effect and result in enough force to the brain to cause a concussion. 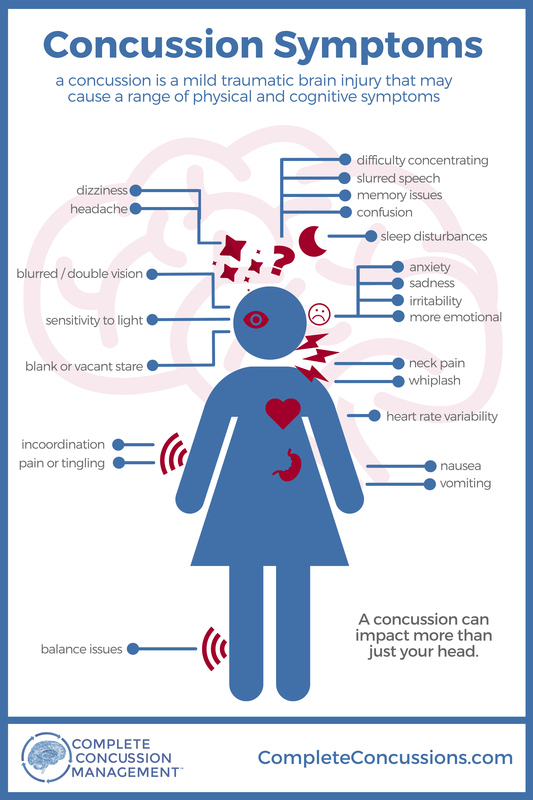 If you experience any one of these symptoms following a significant impact to the head or body, then you should have a high suspicion of concussion. 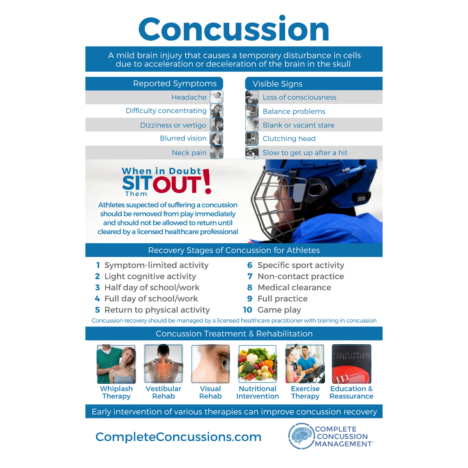 Download our free concussion symptoms infographic. No; however, research demonstrates that reducing contact in younger athletes can decrease the likelihood of concussion. Most concussions happen during a collision when the player isn’t ready for the impending impact. Concussion is an acceleration injury and embracing for impact and stiffening your neck may reduce the force transmitted to the brain. Therefore, having game awareness may help to anticipate hits or impacts, and allow a player to brace accordingly. Research shows that helmets cannot effectively prevent concussions, but can play an important role in protecting the skull from fractures. Always tell a parent, teacher, coach and/or friend, if you, a teammate or even an opposing team member may have suffered a concussion. When in doubt, sit them out! 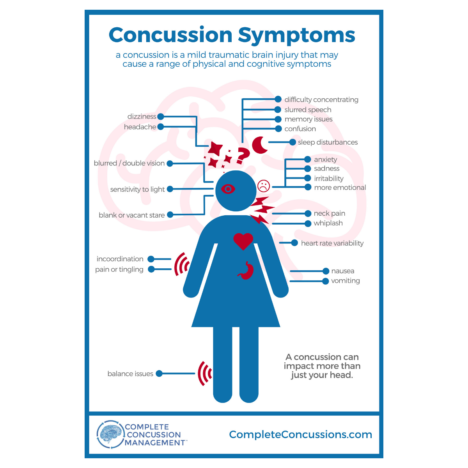 The first 24-48 hours following a concussion are critical due to the potential for a more serious injury that may require immediate medical attention such as a bleed or swelling in the brain. Following the injury, the patient should be monitored for at least 3 hours for any worsening of their condition as this may indicate bleeding or swelling in the brain. Immediately go to the nearest emergency department if any of the following signs or symptoms are present. These are known as red flags. 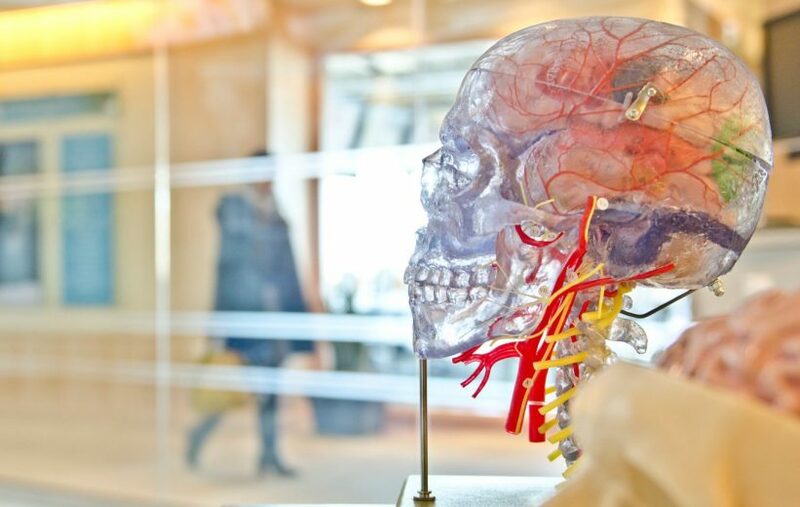 It is important that patients receive a proper neurological evaluation and management advice as soon as possible following a concussion as this can significantly impact recovery. Concussions are difficult to diagnose because symptoms may not be present immediately following an impact, and the symptoms are like those of other common injuries such as whiplash. Healthcare practitioners and all those involved in concussion care should err on the side of caution. If there is a significant impact and at least one concussion symptom, an athlete should be removed from play and assessed by a licensed healthcare practitioner with training in concussion management. When in doubt, sit them out! A concussion impacts how the brain functions, and as a result, cannot be detected by MRI or other brain scans. Because symptoms often resolve before full recovery of the brain. Therefore, having a comprehensive, multimodal baseline test done prior to the injury can assist healthcare professionals in making an accurate diagnosis as well as safer return to activity decisions. Up to 90% of concussion injuries can resolve symptomatically within 7-10 days; however, in some cases, concussion injuries have longer lasting symptoms. If you experience symptoms beyond 4 weeks, this is known as post-concussion syndrome. Very little is known about what causes post-concussion syndrome. It is currently believed to be due to continued blood flow abnormalities in the brain, continued energy deficits in the brain, psychosomatic disorders, vestibular/ocular issues (integration between visual and balance systems) and/or potential dysfunction in the muscles and joints of your neck that occurred because of the impact. Are there treatment options for a concussion? During the early stages following injury, relative physical and cognitive rest is recommended for 24 to 48 hours; however, these decisions are made on a case-by-case basis. Following a short period of rest, treatment and rehabilitation may include a gradual increase in mental and physical activity. If symptoms persist beyond 10 days, exercise therapy, manual therapy of the neck, diet and nutritional interventions, and vestibular and visual rehabilitation are proven to be effective treatment and rehabilitation options. There are currently no over-the-counter or pharmaceutical interventions to speed concussion recovery. What are the steps to return to learn, work or play? Licensed healthcare practitioners should provide step-by-step processes and graduated stages of recovery to help concussion patients and athletes return to learn, work and/or play. This process may vary by individual. We recommend that you schedule an appointment with a licensed healthcare practitioner if you are at risk for concussion or have suffered a concussion. 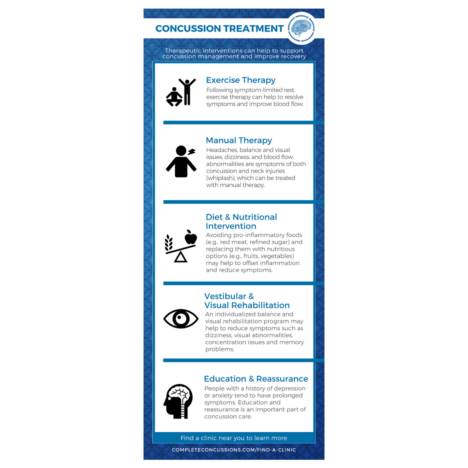 Click here for the Recovery Stages of Concussion infographic. A concussion is known as a mild traumatic brain injury (mTBI) and, by itself, is not a fatal injury. The concern in the initial few hours to days is not the concussion, but rather that there may be a more severe injury than concussion such as a bleed or skull fracture. Also, there have also been cases where individuals have died from secondary concussions that occurred before full recovery of the first concussion, this is known as Second Impact Syndrome.